Kristen F. Davis Designs: new kitchen. last week, i had the fun job of painting my best friend's kitchen! she bought her house a couple of years ago, and always felt like the cabinets should've been black. you know when something just doesn't seem right? welp, now they are! it was really fun to work at your friend's house, and we love the way they came out. it just seems like SO much wood in the room - not very much contrast. plus, besides having wooden floors and wooden cabinets, her countertops kind of blended in with the same tones as the floors and cabinets. we love the way the colors in the room now pop! and, her hardware "matches" the new look much better than before. Such a great job! Love the new color! You did an awesome job Kristen! What a difference the black makes! Question for you: Did you handpaint or use a sprayer on this? I'm gearing up to paint my cabinets as well and am wondering what the best route may be. Wow, what a big job! It looks fantastic, huge difference. I love the new kitchen. Black was definitely the right color choice! Beautiful job! Wow Kristen, you did an amazing job. It looks like new kitchen cabinets. The black is fabulous. Thanks for sharing. Oh my gosh, that looks incredible. I've never seen black cabinets look so good. Please please please tell me how you painted them. I have old oak cabinets begging to be painted and I would love your step by step on what you did. Beautiful. Your kitchen looks so rich! LOVE it ! ! ! I would paint mine black in a heartbeat, but how do you think that would be for resale? We'll probably sell in a couple years. I love this!! I saw a sander in one of the previous pictures, did you sand them down before painting them? They look amazing!! I would love a step-by-step tutorial too!! If you don't mind, that is! thanks so much for all the complements. anonymous - yes, i do sand them before painting them. patty b- i will be honest and say that i think you should do what you like, and not be afraid of reselling! i know that it's popular in today's culture (with all the TV shows, bad economy, etc.) to worry about reselling your home, but honestly, i feel like people should do what makes them happy! if you want to paint your cabinets, paint away. i will say, however, that i think it should be professionally done, and not "DIY" at home. sometimes doing it yourself can lead to a bad paint job, therefore creating a finish that you and anyone else might see as a 'downgrade'. un-freakingbelievable. I can't believe it is the same room. Oh wow! What a difference! ♥!!! so perfect! i know your bestie is loving her new kitchen! what a transformation. great job! First, you're really very talented. 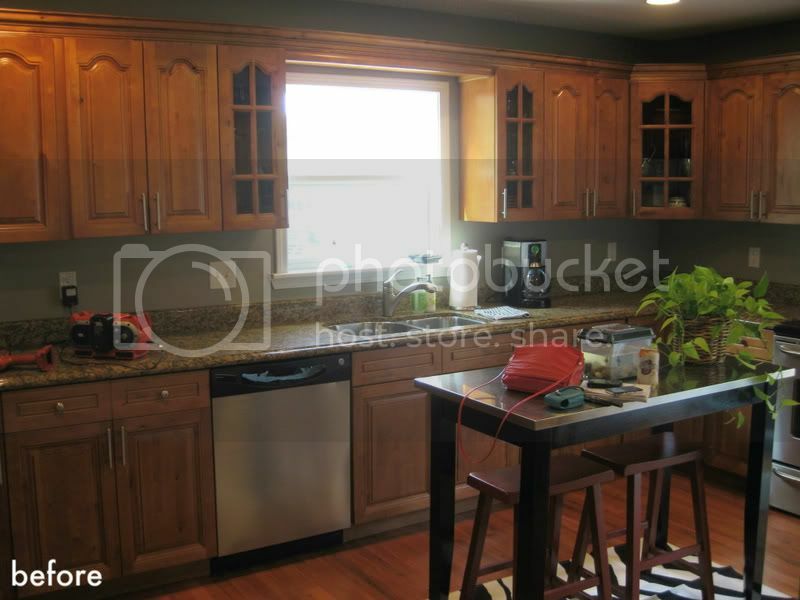 Second, this kitchen looks light years better. 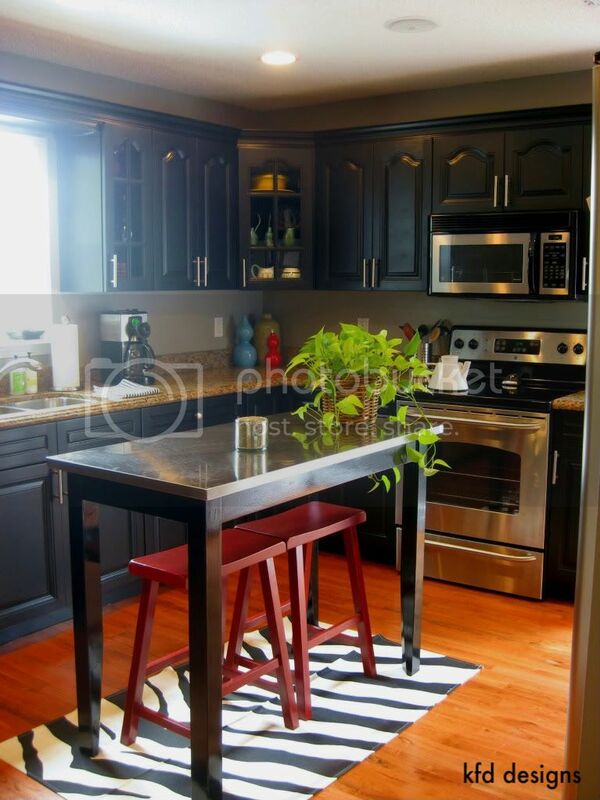 I hate standard kitchen cabinets and I especially loathe that silly cherry/faux luxe color. Again Kristen, you did a fabulous job. I do have a couple of questions, if you don't mind me asking...What brand paint and what sheen do you use? 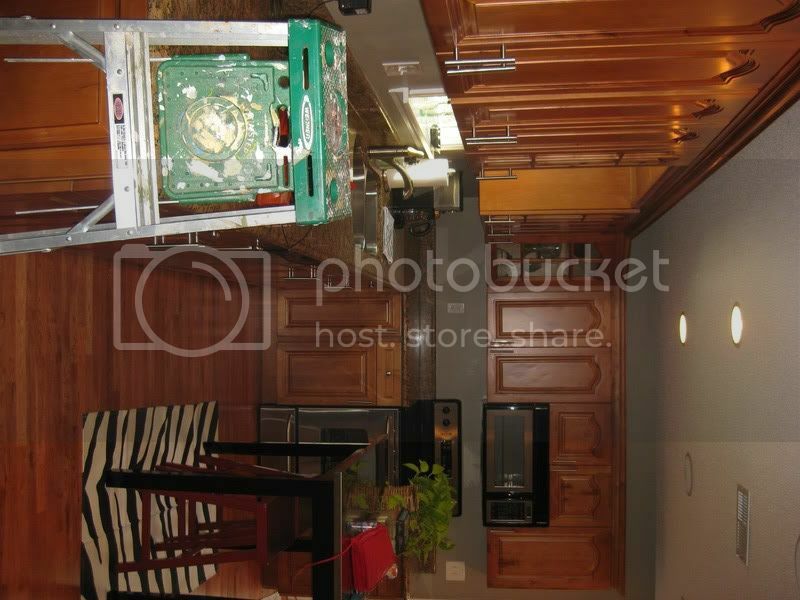 Do you polyurethane over top and do you use a roller/brush or do you spray the cabinets? Thanks so much for your time. This is gorgeous! Truly the right call. Well done! Love all your transformations! My husband built new cabinets for our kitchen redo...we painted them black, planning to distress them. We used white paint under the black, but when we sand the edges, we keep accidentally roughing up paint around the distressed area. We tried applying dark brown glaze over the distressed areas...and that dulls the black paint. 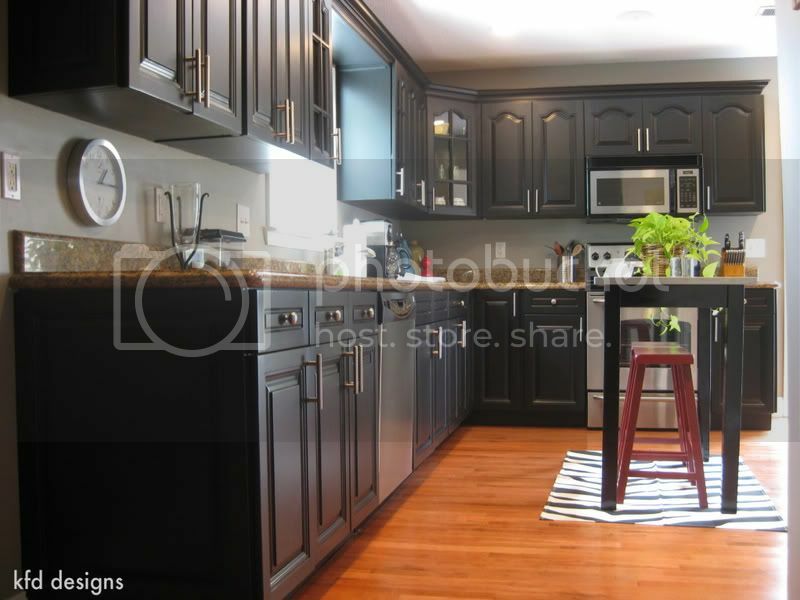 Do you have any tips for distressing black cabinets?? the breakfast nook: a do-over. chair makeover + my dresser for sale! little stool and a little cat (without a tail).